The Condor caught 51 Yellowfin Tuna, 3 Dorado, 2 Yellowtail, and 35 Skip Jack on their 1.5 day trip. The Pacific Queen caught 319 Yellowfin Tuna, 36 Yellowtail (18-30#), and 1 Dorado on their 3 day trip. The Pacific Dawn called in with LIMITS of Yellowfin Tuna (12-30#). 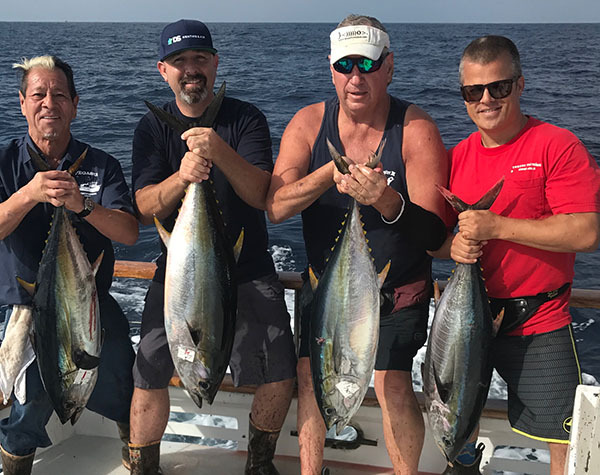 The Liberty caught 66 Yellowfin Tuna, 30 Skip Jack, and 20 Bonito for 42 anglers on their Full Day trip. The Fortune called in with LIMITS of Yellowfin Tuna on day 1 of their 2 day charter. The Dolphin AM called in with LIMITS of Bonito (5-10#) for 12 anglers. The Dolphin PM trip caught 28 Bonito, 39 Rockfish, 8 Sheephead, 8 Calico Bass, and 4 Sandbass for 20 anglers. The Pegasus returned this AM with LIMITS of Yellowfin Tuna (90) for 18 anglers.